B.N. Hebbar teaches Religions of the East and a variety of specialty courses such as Indian Philosophy, Zoroastrianism, Shintoism, Doctrine and Debate in World Religions, Minor Religions of India, South Asian Buddhism etc. He was one of the recipients of the Bender Teaching Award in 2006. He was thrice nominated as a recognized faculty member at the Freshman Scholars in Residence annual appreciation event at George Washington University. He had his traditional and academic education in India and lived for sometime in Sri-Lanka and Thailand studying Theravada Buddhism. He received his bachelors and masters degrees from George Washington University. He taught at the University of Maryland Honors Program for a decade. He has lectured on Eastern religions at the Virginia Theological Seminary, the Smithsonian Resident Associate Program and at the Johns Hopkins Osher Program. He has briefed Fairfax County high-school teachers on how to teach the Eastern religions. 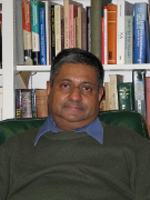 He has lectured on Hindu bioethics at seminars in NYU Medical school and Harvard Medical school. He has co-authored articles on Hindu bioethics with a Temple University medical school associate. He has advised the Pentagon Board of chaplains in Hindu religious matters during the First US-Iraq War. As an advisor to the International Buddhist group, he has received awards from the Cambodian and Korean Buddhist communities. He attended a conference on Bodhidharma (a 5th century CE South Indian Buddhist monk who went to China) in New Delhi in November 2015. He is currently the Executive Vice-President of the International Buddhist Association of America (IBAA). He has authored articles on South Indian Vaisnavism in Harper-Row Dictionary of Religions and in theJournal of Vaisnava Studies. He has authored two articles in the Journal of Indian Philosophy & Religion in 2016 and 2017. He has authored three books: The Sri-krsna Temple at Udupi (Nataraj Books, 2005), Visistadvaita and Dvaita (Nataraj Books, 2005), and Who is the Supreme God: Visnu or Siva? (Nataraj Books, 2011). He received his Ph.D. from the University of Utrecht (Netherlands). He also has a D.Litt. from the University of South Africa.